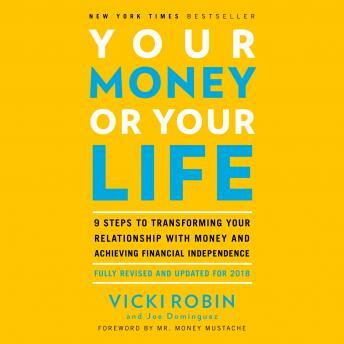 Listen to "Your Money or Your Life: 9 Steps to Transforming Your Relationship with Money and Achieving Financial Independence: Fully Revised and Updated for 2018" on your iOS and Android device. For more than twenty-five years, Your Money or Your Life has been considered the go-to book for taking back your life by changing your relationship with money. Hundreds of thousands of people have followed this nine-step program, learning to live more deliberately and meaningfully with Vicki Robin’s guidance. This fully revised and updated edition with a foreword by 'the Frugal Guru' (New Yorker) Mr. Money Mustache is the ultimate makeover of this bestselling classic, ensuring that its time-tested wisdom applies to people of all ages and covers modern topics like investing in index funds, managing revenue streams like side hustles and freelancing, tracking your finances online, and having difficult conversations about money.